Lifetime manufactures some of the best plastic Adirondack chairs that are available in the market. When you order a chair from them, you may need some time to assemble the chair but the process is easy. The best thing about the chairs is that these are very affordable and that means you can purchase multiple chairs to have sufficient seating for your lawn or patio. There is nothing relaxing than a fine day and you and your friends sitting peacefully on your Adirondack chairs. Lastly, these beautifully designed chairs will add sophistication and style to your home. UV-Protected: The best feature of the chair is that it is already protected from the harsh Ultra Violet light that comes from the sun and damages the material. And that means it will not get rusted, cracked or chipped. So the chair is perfect even for areas of rough weather like Florida. Comfortable: This Adirondack chair is made from a very comfortable material that would not feel hard or harsh on your back or hips. The gaps in the seat and the back of the chair will make sure you continuously get a passage of air so you don’t sweat. Stain Resistant: The chair is made from a durable material that is not easily damaged. That means besides being a good quality hard wearing chair, it will not get permanent stains that can damage its overall look and make you paint it to hide those stains. Also, the screws are made of stainless steel. Easy To Clean: One of the best things about the Adirondack chair is that it is quite easy to clean. You will not have to spend a lot of time to clean the chair. Just use a piece of cloth and dust it. If it gets too dusty, you can also use some cleaner that is made for cleaning these items. Polystyrene Construction: The chair is manufactured from a very tough material, polystyrene. The good thing about this material is that it is resistant to bad weather and it also protects against harsh sunlight that can damage many of these types of chairs. 2-Years Warranty: Most of the chairs either do not come with a warranty or they come with one year warranty. But in the case of this Adirondack chair, lifetime has given a warranty of two years. And that period is just for warranty, who knows how long these durable chairs may last. 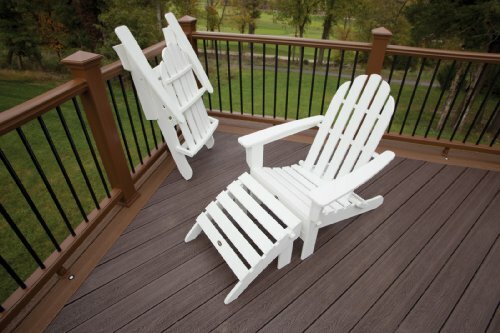 Difficult to Get Parts: Although their chairs are great, one thing that is a major drawback with Adirondack chairs by lifetime is that their parts are not available everywhere. And to get the parts, you will have to contact Lifetime directly. The bad thing about them is they are slow in shipping out the parts. Hard to Assemble: One of the major drawbacks about this chair is that it comes disassembled and it takes quite a time for assembling it. Also, it has a lot of nuts and bolts that need to be put into place and that can take some prior experience. But other than that, the chair is great. With the Folding Adirondack chair by Trex Outdoor, you can enjoy a little “me time” anywhere and anytime. It provides all the relaxation and comfort that you can expect from an Adirondack chair. Also, it has a convenience of easy folding making it all in one choice for your outdoor furniture. Lastly, the chair is eco-friendly and asks for very low maintenance making a perfect choice for someone who likes just to relax and not care about anything in the world. UV-Protected: The Trex Outdoor Folding Adirondack chair comes with a UV protectant that makes it tough and hard to be damaged. Also, due to its UV protection, it will not require any weatherproofing as it will not be affected by the harsh rays of the sunlight. Stainless Steel Hardware: One of the best thing about the chair is that it’s hardware like nuts and bolts are made from stainless steel. This means that the chair will have a lot of longevity to it. Also, its hardware will not get stains and that will protect its overall look. Foldable: The best feature of this chair that is its unique selling point as well is that it is foldable. Meaning you can easily fold the chair to make it smaller. That will help you in transportation and storage of the chair. Its folding part is secured with a pin so it will not fold if someone is sitting on it. Easy to Assemble: Unlike other Adirondack chairs that are sometimes hard to assemble, this one is pretty easy to assemble. It comes with basic tools and easy to follow instructions that make its assembly a piece of cake. It will hardly take 20 minutes for you to assemble the whole chair. Resistant to Environmental Stresses: Due to its high-quality manufacturing, the material of this chair will not wear out especially because it is plastic. Moreover, it is built to withstand an extensive range of climates including but not limited to snowy winters, strong coastal winds, and hot sun. Also, it is resistant to corrosive substances, salt spray, stains and other environmental stresses. Durable & Comfortable: According to the official website of Trex Outdoors the chair has a marine-grade hardware quality. That makes it long lasting and very tough. Also, it is very comfortable to sit and due to gaps in its back, you will not sweat if you sit for long hours. It takes Time to Fold: One of the drawbacks with this foldable chair is that it takes a bit of time to fold as you will have to remove a pin To unfold them. While the pin secures the chair from accidentally folding when someone is sitting on it, it takes quite a time to remove the pin, fold the chair and then again put the pin back inside. Slightly Smaller: Another drawback with this chair is that it has a slightly smaller size than the standard Adirondack chairs. Now it doesn’t mean that it is a small chair, it just has a bit of smaller size so it will not fit heavyweight people but is perfect for people of normal size. 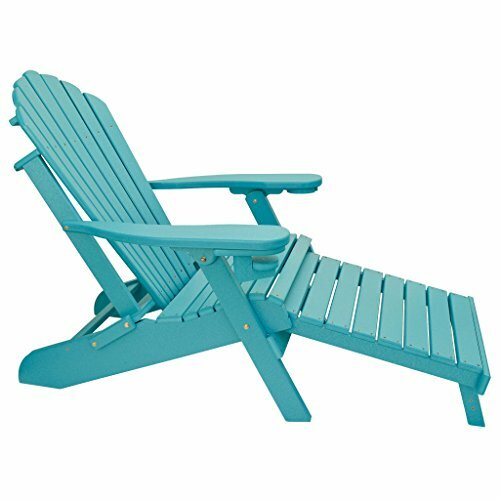 The Folding Adirondack chair by ECCB comes with an integrated footrest that will help you take a moment of relaxation and peace. You can just spread your legs, put your hands behind your head and take deep breaths while picturing peaceful scenery in your mind. The beautiful thing about the chair is that it is foldable so you will not have a tough time carrying it out to the patio or in the house from the patio. It is a perfect companion when you need some peaceful time by yourself. Comes with Footrest: The main feature of this Adirondack chair is that it comes with a footrest. This means you can easily spread your legs and relax on the chair. Cup Holder: The chair also comes with a cup holder that can be used to hold coffee cups, glasses and cell phones. You can rotate the cup holder underarms when they are not in use. Foldable: Another unique feature of this Adirondack chair is that it is foldable. You can easily fold the chair that will make it easy to carry it, transport it or store it. 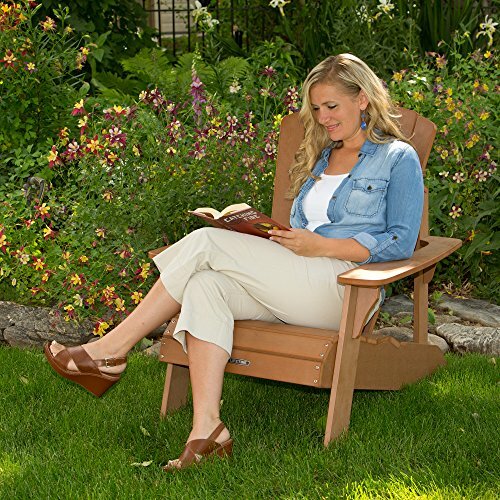 1 Inch Boards: Unlike the traditional Adirondack chairs that come with 3/4 inch boards, this chair comes with the arms and legs of 1 inches that gives the chair additional support. Easy to Clean: You can easily clean it by just using the soap and water. No other chemicals are required to clean it. Long Lasting: It has stainless steel hardware that increases the longevity of the chair. Also, it is resistant to fungi, insects and salt spray. Lastly, it will not crack, rot, peel or splinter. Gets Hot: The only drawback with this chair is that it will get a bit hot if left too long in the sun. But why would you leave your chair in the sun? Also, you would not sit in the sun as it will be blazing hot. But other than that, the chair has no drawbacks. The aforementioned Adirondack chairs are the best ones in the wide range of different Adirondack chairs. There is no better chair between all three of them and it all comes down to what your needs are. If you want a chair that just sits where you place it and you can enjoy with your friends whenever you want, the first one by Lifetime is the one you should go for. If you want a chair that is perfect for your alone time and is easy to carry by simply folding it, then you should consider the one by Trex Outdoor. Lastly, if you want some alone time with full body relaxation then you should go for the one by ECCB as it has a footrest. To be honest, all of these are perfect and it all comes down to what your needs are.